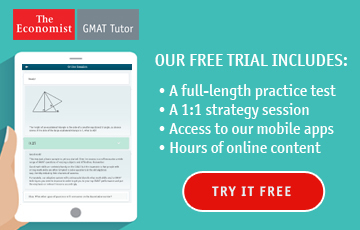 Wanted to share a post about my GMAT journey which started 2 years ago when I did some quick prep on my own and having no real high aspirations about a high GMAT score, as I was targeting local, part-time programs, with my company paying for the cost of the MBA. I walked away with a 510 (36Q, 25V) and not really affected by the low score as the rest of my background was pretty solid (very high GPA, good work experience in finance, international projects etc). Fast forward one year later, the company downsized 2/3 of the employees worldwide, 70% of the clients left and I soon found myself with a pink slip on my desk. 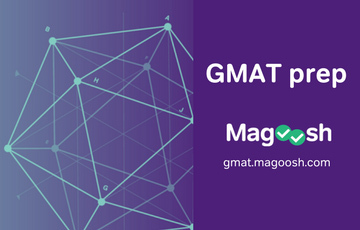 After getting over the shock of the 'new normal', I realized that this was my opportunity to map out my academic and professional future (to the best of my abilities) and I dived into a high priced GMAT course with one of the big companies. 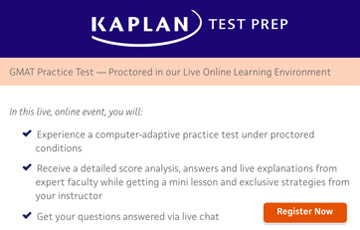 After using their extremely detailed materials (broken down by topic) as well as practice exams along with a brand new GMAT prep (and hitting 700), I sat for the exam a second time in mid 2009 and walked away extremely disappointed with a 610 (38Q, 35V). I had a very weak math background (hardly one year in high school) and I knew that I had to tackle math head on to achieve an attractive score. 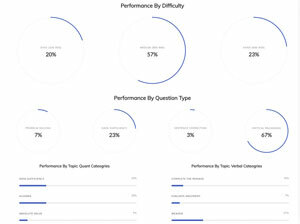 During a trip to Europe I came across a post on BTG (one of my most visited sites during that time) and decided to have a quick chat with the GMAT Ninja (http://gmatninja.com/) and map out a strategy to get me to my target score: 680+. Excited about my future tutor's experience and practical steps, I met with him a few weeks later in NYC and was even more impressed with his method/recommended homework/reading material etc. My goal was to eliminate the element of surprise every step of the way (especially for math) and my tutor accomplished exactly that: he started out by testing me on several GMAT math concepts and once he grasped my weakness, he would explain the concept in detail and practice this concept through several exercises, increasing the level of difficulty and twisting the question in every way possible until the concept being tested was tattooed in my brain--this allowed me to tap into that brain pattern each time I saw the above concept tested. Although I'm not a native English speaker, verbal turned out to be my strength. Hence my tutor recommended the toughest material: retired LSAT tests and LSAC study guides with answers/explanations. He emphasized the importance of reviewing the answers (and understanding where I went wrong: missing a detail, rushing through the question, not paraphrasing the argument in my head before trying to answer etc). The difference between practice this time and the last was tactic: I was only practicing for 2-3 hrs/day, a bit more during week-ends, but this time I was reviewing my work and spending more time on review than actual practice. I even wrote down lessons learned/takeaways so as not to repeat them again. Day of the test: my exam was scheduled at 8AM. I had a very light breakfast: boiled egg, half a slice of toast and half a cup of cappuccino. Got to the test center early and walked around the block a couple of times just to get the blood circulating. AWA was relatively easy: I got 2 business/marketing concepts which I breezed through. Took the first break: ran to the rest room, splashed cold water into my face and neck to force the bloodstream upwards and ate half a banana (read somewhere that potassium facilitates the blood flow throughout the body). I was almost scared NOT TO SEE any questions that I didn't know how to tackle and though to myself: here we go again--more studying coming up. I finished up the last few questions feeling pretty down as the questions felt EASY, but I carried on anyway, finished up quant and ran to the rest room to rinse my face with icy cold water again. Ate half a snickers bar and drank some water and walked back in for Verbal. Surprisingly RC didn't feel difficult at all (no science passages, just Finance, Energy, Art History). SC and CR felt much more difficult than anything I'd seen--I took that as a good sign, but didn't obsess too much and I carried on. Finished with a bit of time left over, hurried through the demographic questions and went I was asked whether I wanted my score report . I hesitated for a second, prayed, breathed deeply and clicked "yes". Then I put my head on the desk and closed my eyes for 5 seconds: the screen came up and I saw 710 (48Q, 39V; 5.5 AWA a week later). Was definitely flabbergasted with the 48 Quant (would have been happy with 44) and disappointed with Verbal (had been scoring between 40-44 in past practice exams for several results of 730: 49Q, 40V and 47Q, 42V). 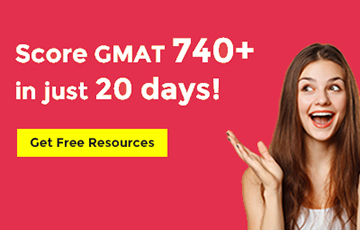 Overall I was satisfied with the 710, although I do blame myself for scheduling the last practice GMAT prep only 2 days before the real thing: after reviewing the prep and practicing the wrong questions, I was really only left with 1 day off. PLEASE give yourselves at least 5 days off just to chill before the real thing--you'll need all the physical and mental stamina that you've got! 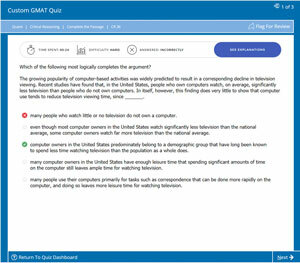 GMAT Prep (one repeat, but couldn't remember any of the questions since last practice was 1 year ago). 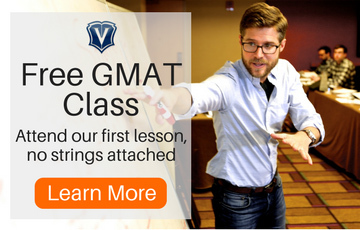 I am done with the GMAT, but the experience will stay with me for a lifetime. 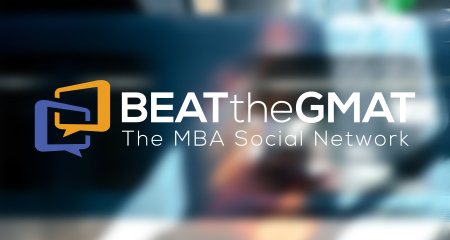 Thanks BTG and thanks GMAT ninja--would have been a different story without you :0)! Thank you for the endorsement! It was great to read your whole story again--I'd completely forgotten about the 510. You always seemed destined for a 700+ score, so I think I managed to put the 510 and 610 out of my head. It was a lot of fun to watch you work like a madwoman, and even more fun to watch you kick some GMAT a** in the end. Congratulations! Let us know as soon as you hear back from b-schools! 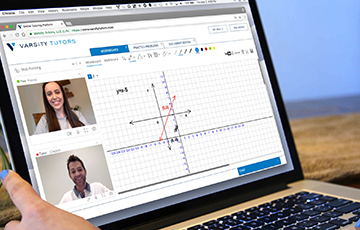 what did you think about the gmat hacks material? 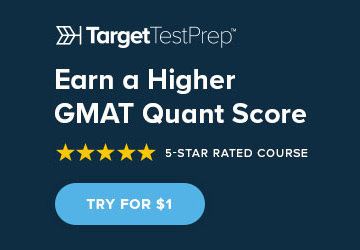 I don't want to make false accusations, but I believe everyone here should be wary of working with the "GMATNinja" until they get proof of that his references on this forum are indeed real and that he did indeed score a 780 on the GMAT. I am not trying to defame this person, but my experiences contacting and researching his background have made me HIGHLY suspicious that the people posting these "success stories" on BTG are not real people. Maybe I'm wrong (and I hope I am), but I think anyone about to shell out $150 should be alert to the very real possibility that this person is scamming them. 1) All of the reviews about my services on BTG are 100% real, and I did not write or solicit any of them. After Hari posted some positive comments about me on BTG, students began to find me after reading his comments, and then chose to post a positive review when they were pleased with my services. Again, the reviews were their choice--not mine. I cannot control the fact that some of them have not been regular BTG contributors. And for what it's worth, I consciously post very sparingly on BTG, exactly because I don't want to be seen as using the site for personal gain. 2) I have never "promptly turned down" anybody who has ever asked me for references of any sort, and I have never been asked specifically for references from these success stories. Of course, all of these reviewers would be happy to serve as references, and I could easily connect a potential student with them... but nobody has ever asked! 3) I very rarely get asked for official score report, and I don't think that "gorginger" ever did so. I went through my emails, and found only one person who has asked me for a score report in the past year... and I told her that I would be happy to show it to her. My 780 is real, and I have the reports to prove it. 4) Nobody has ever asked me for both an official score report and to identify the writers of my online reviews. I can't understand why somebody would make this up, but gorginger's story is, unfortunately, completely false. 5) I don't necessarily mind that somebody is posting negative things about me online--I'm not perfect, and not all of my students achieve their dreams. But unfortunately, "gorginger" seems to be inventing facts. If you're going to speak badly of me, please do so in an honest, well-informed way. I pride myself on being brutally honest, both as a tutor and as a human being... and I could provide dozens of references from recent years who would enthusiastically endorse my character and my work. I don't make any guarantees or claims that I can't back up--there are no shams or scams here, just a guy trying to make an honest living as a tutor. GmatNinja, I think there is some fact in gorginger objection. All these success stories are of two type of user, inactive users profile created long back or new one with little or no activity. I have lurked through your site long back several times, and I am of the opinion you have a solid backgrounds and credibility. But these posts are definetly suspicious. 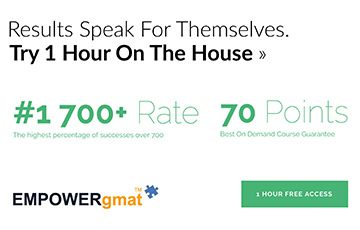 Also, on your site you claimed gmat score 790(51/47) why you are quoting 780 here. Read my website carefully, Maihuna: the score is a 780. I'm 100% honest about it, and the official score report is here for anybody to see. Please do not misinform people about my website--it isn't a very nice thing to do. I still have no idea who gorginger is (do you know, Maihuna? ), but gorginger created a BTG account for the sole purpose of attacking my character in a dishonest way--no prospective student has ever asked for the identity of these reviewers and my official score report... and I would easily give them out if somebody had. Gorginger was completely lying, and I have no idea why. It's true that several of these reviewers weren't regular posters (and I completely understand why somebody would be suspicious of that! ), but I have absolutely no control over my reviewers' activity on this site, and it's unfair to attack my credibility on this basis. Two of my reviewers have already posted (unsolicited!) defenses of my character and services, and you'll notice that gorginger removed the offending post. 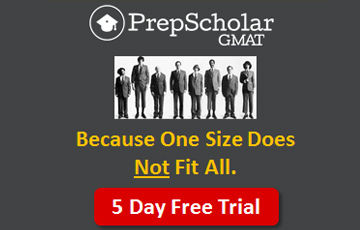 I know that there are plenty of GMAT snake-oil salesman out there, but I'm not one of them. Ohh GmatNinja, I might have forgotten it, sorry, I visited your website sometime last year, I do remember !51 V47 breakup atleast, not sure if 790 slipped in as memory gap. Sorry in case it is not so. See I have read all your posts and liked your attitude and straight forwardness(U did mentioned u started with a very modest score and made your ways till 780/90 whatever, very few people do that once they score higher one). My only intention was, no doubt on your personality, sorry if I have looked so, but as you too agreed their is certain pattern in these posts which looks questionable. I do not gorginger though. Thank you, maihuna! I appreciate the response. And yes, I completely agree that the posts look a bit funny. It's made me nervous in the past, but it would be pretty weird for me to... I don't know, ask the reviewers or BTG to take them down? It's a tough spot. I'm thoroughly honored to have such honest, glowing reviews from these guys... but I can definitely see how the very same reviews could undermine my credibility if they're viewed in a different light. I wholeheartedly believe that any online review--of me, or of anybody else--should always be taken with a grain of salt. All I ask is that people read some of the 30,000+ words of text on my site to understand who I really am before passing judgment. I'm pretty "naked" (not literally) on my website, and hope that potential students make an informed decision about me, rather than putting 100% faith in anonymous forum posts... regardless of whether those posts are negative or positive. Thank you again for the response and the kind words, maihuna. I think that first post sounds awfully like an ad, too. 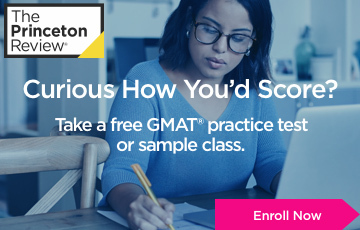 I mean...it mentions "high priced" gmat companies, but doesn't offer a name? It's like a commercial where a company compares its own offerings to "the other guys". Lol... yeah, I suppose you're right. No disrespect to the writing talents of loyolausa (who, incidentally, is currently at a top-tier school and is happy to speak with anybody who might question her story or identity), but it does have that "better than the leading brands!!!!!!" feel to it in a spot or two. Her intentions are honest, though. Again, you're all encouraged to take this review with as many grains of salt as you wish... but please don't judge based solely on a few online reviews. I can provide literally dozens of references, and there are pages and pages of material on my website. Judge me on everything I've done, not just on a handful of forum threads that are beyond my control.